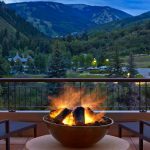 The Penrose Room is the only five star, five diamond restaurant in Colorado. 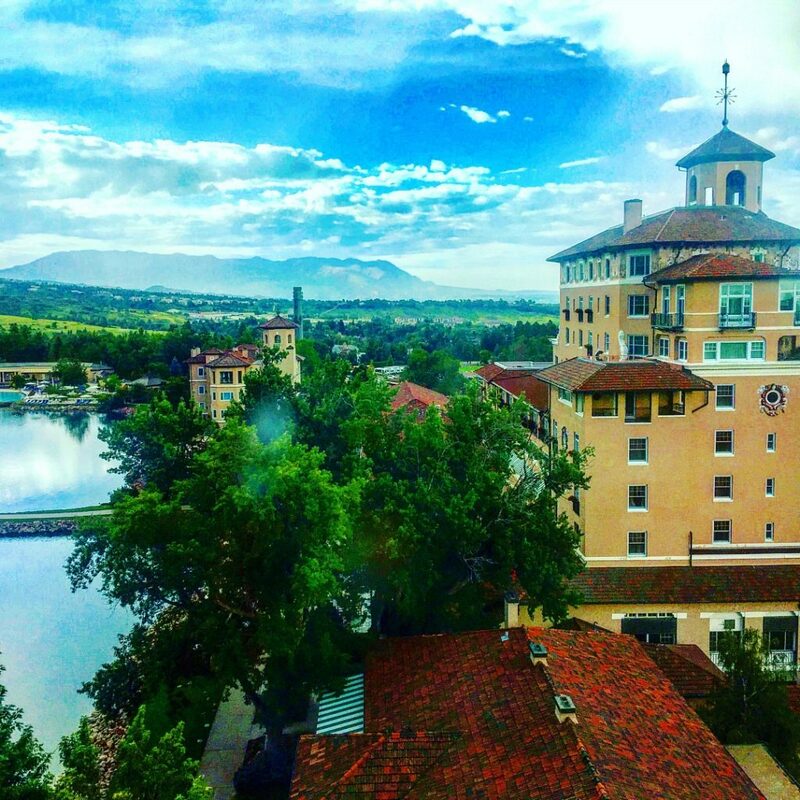 It is located within the grounds of the iconic Broadmoor Hotel, on the top floor of The Broadmoor South building. 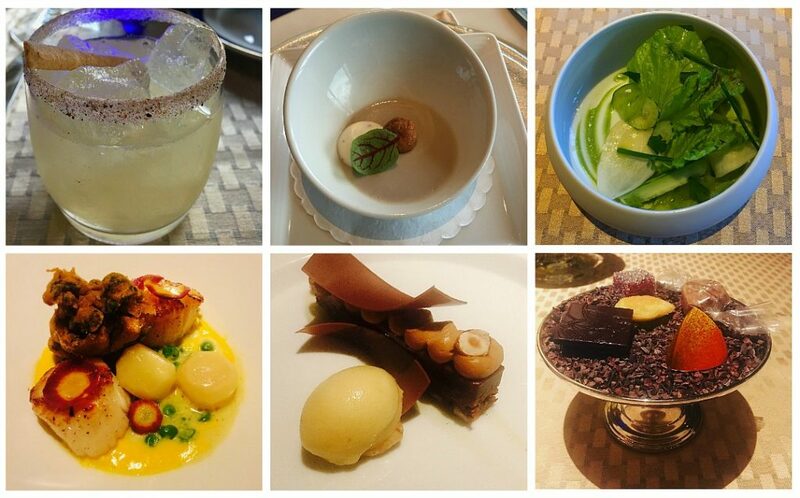 A seasonal menu, decadent atmosphere, live music and amazing views of the city create a luxurious dining experience. The Broadmoor landscapes are palatial and you feel like you are on castle grounds. 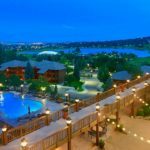 Cheyenne Lake, the Rocky Mountains, and the twinkling city lights of Colorado Springs are right out the window with unobstructed views. Before dinner, we were so lucky to see two rounds of double rainbows That’s four rainbows in one sitting! Mother Nature painted a stunning picture for us. 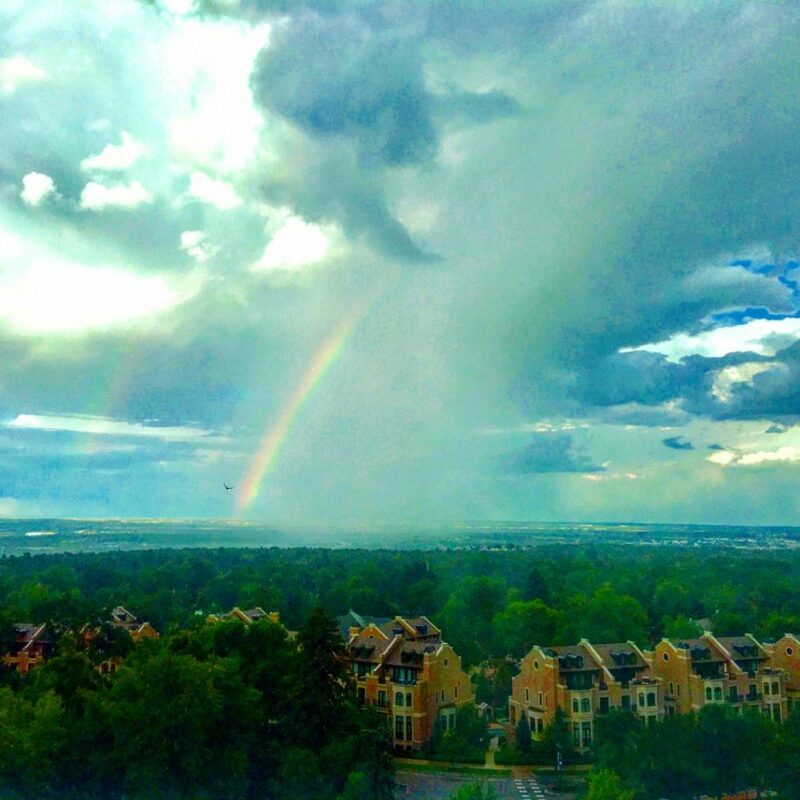 Even without the rainbows, the panoramic views from the Penrose Room are among the best in town. 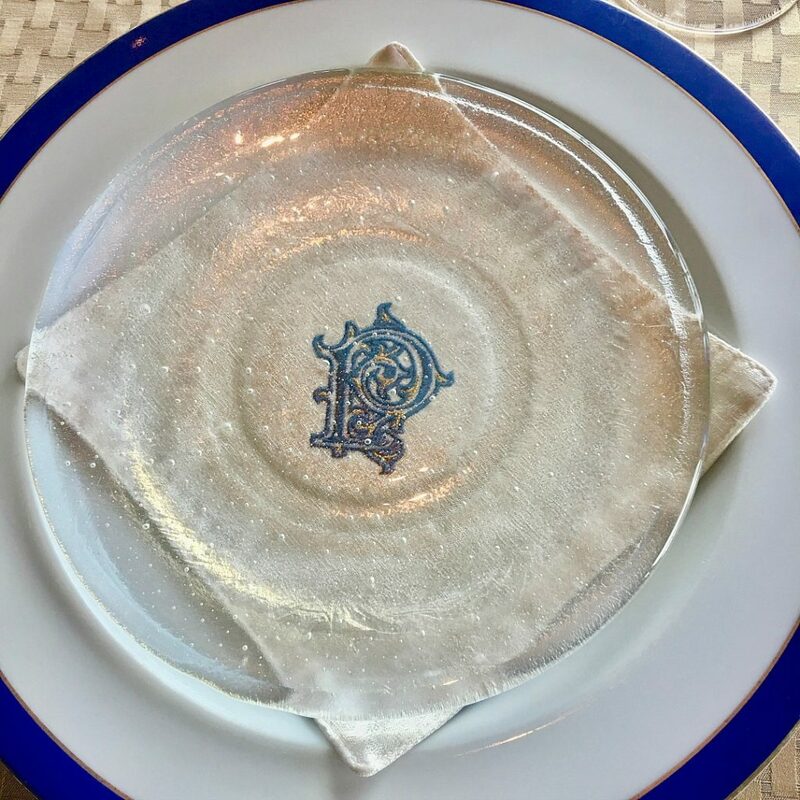 The details of fine dining are embraced at the Penrose Room. I appreciate the formality and extravagant, posh surroundings with sumptuous textiles, huge crystal chandeliers and classic decor. Dinner feels more like a ritual here than what we are used to in our modern world. A ritual with beautiful accoutrements. The Penrose Room chefs strive to use local, top quality ingredients. For instance, the lettuce in my salad came from the gardens onsite at The Broadmoor. We had the three-course meal which began with a craft cocktail and ended with a lovely silver pedestal dish filled with artisan candies. 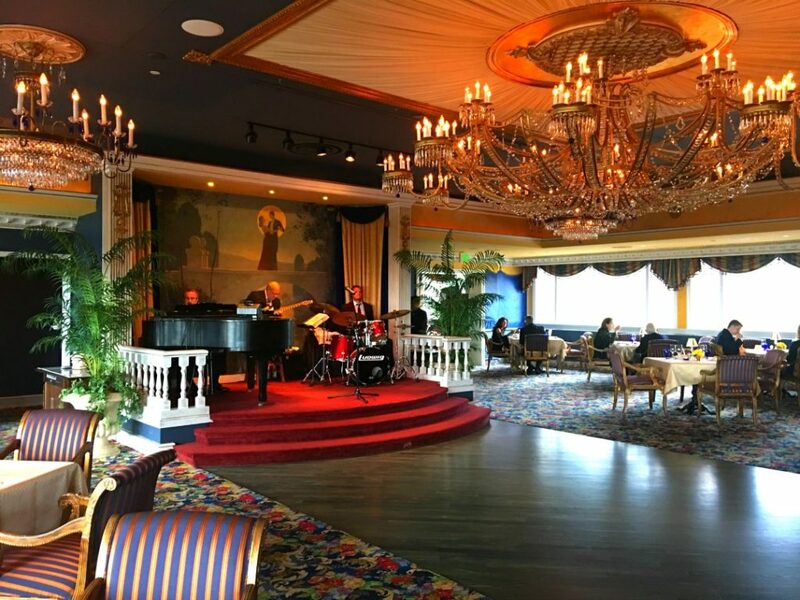 The jazz band plays old standards just loud enough to be pleasing but not overwhelming for dinner conversation. I love that there is a dance floor and that people use it. 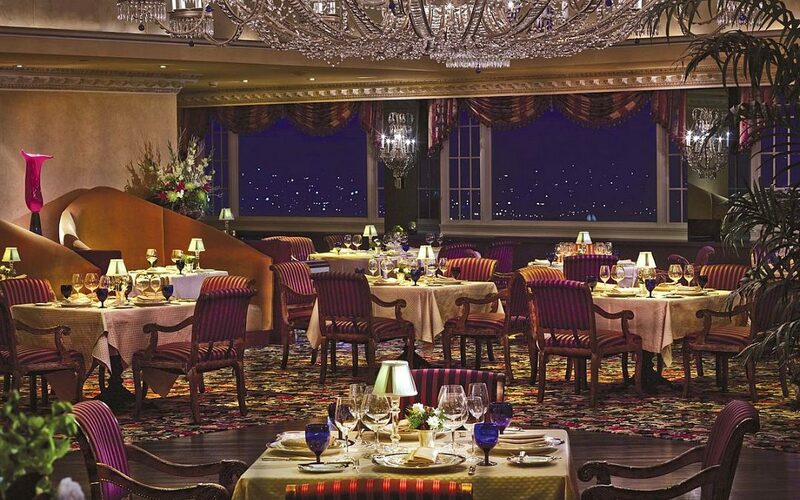 It feels kind of like going back in time a little bit to dine at the Penrose Room. The formalities I remember in my youth, now so rare, are what you experience here. The Penrose Room is the namesake of Spencer Penrose, the black sheep of the affluent Penrose blue bloods. He made his way from Pennsylvania to Colorado, leaving his wealthy family behind to forge his own path in the wild west in the 1890’s. A flamboyant ladies man, the Harvard graduate squandered most of his money fairly quickly. He then got a monetary infusion from his brother and was able to yield tremendous returns through gold and copper, making him a multi-millionaire. 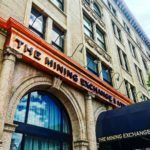 He used his riches to help develop Colorado Springs, becoming one of the city’s biggest promoters. In 1918, he built The Broadmoor, the finest hotel in the state, drawing guests from all over the country to enjoy Pikes Peak via Penrose’s Cog Railway. Penrose was quite a character with some quirky behavior and an interesting sense of humor. For instance had a glass eye that he’d sometimes pop out to shock people. He actually had two glass eyes–one was bloodshot so it could match his other eye when necessary. 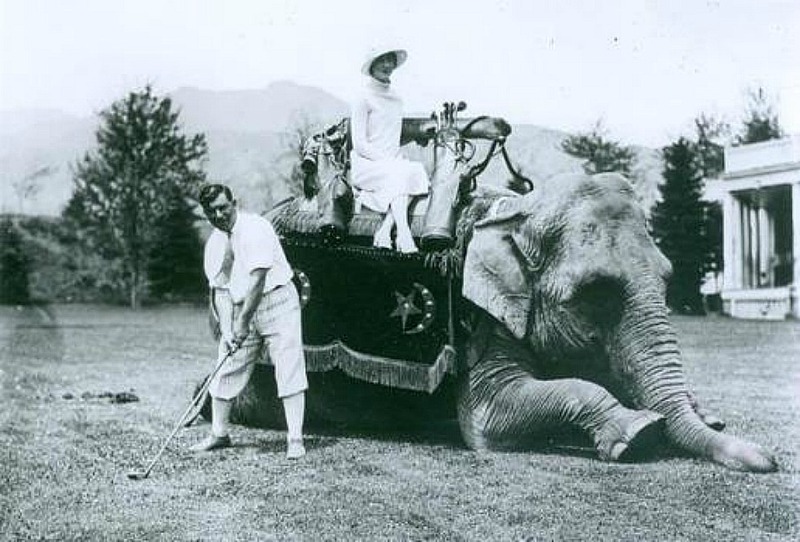 He had an elephant as a golf caddy. At one point the elephant got loose and was running down Lake Avenue. 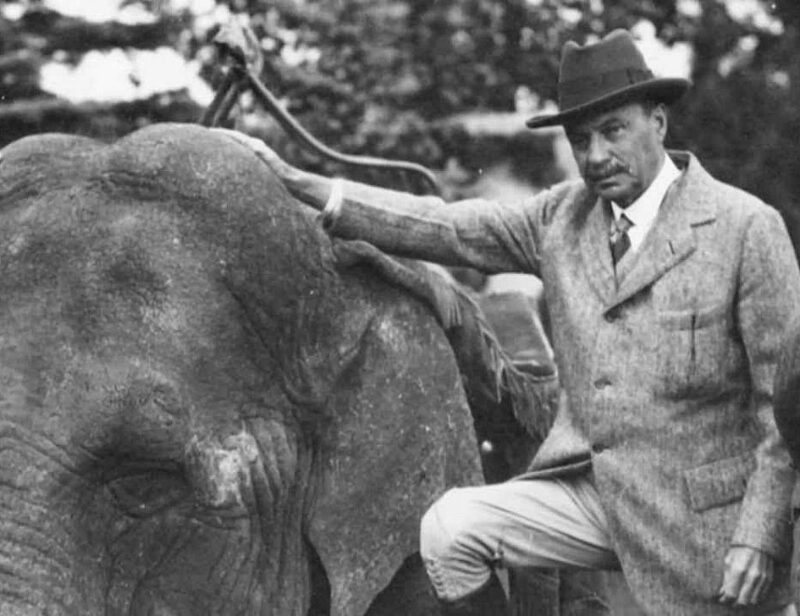 The result was that Penrose built Cheyenne Mountain Zoo in the 1920’s to house his elephants and create another tourist site for his hotel guests. He also had seals in the lake, but when they stole food from the guests, they ended up at the zoo as well. Penrose liked his booze and during prohibition kept stashes all over the property behind secret bookshelves and even under The Broadmoor swimming pool. 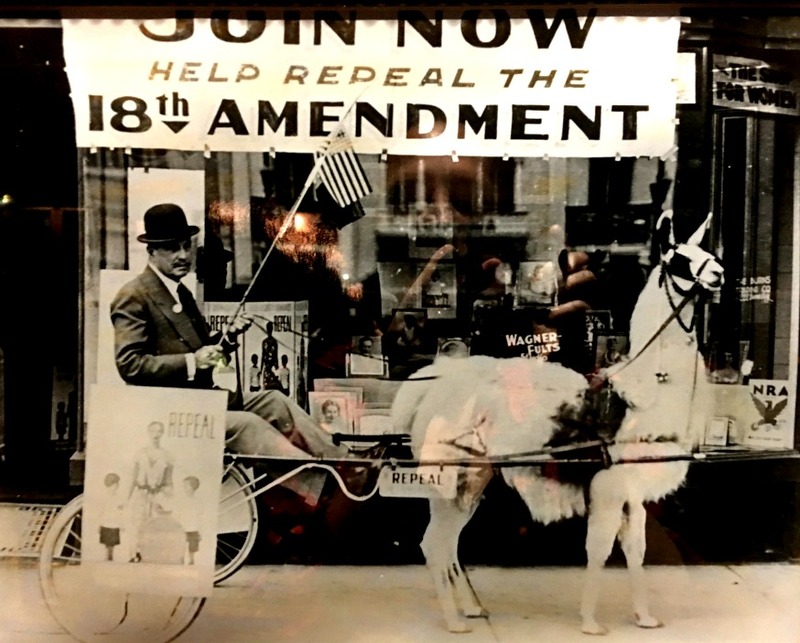 There is a photo in the Penrose Lounge of Spencer Penrose riding around in a llama-pulled cart advocating for the repeal of prohibition. He finally settled down with his wife Julie in his late 40’s. He continued with some of his quirky antics though Julie was a patron of the arts and saw to it that Spencer Penrose became an upstanding philanthropist. Ultimately, Penrose gifted his estate to the people of Colorado via the El Pomar Foundation when he and Julie passed away. 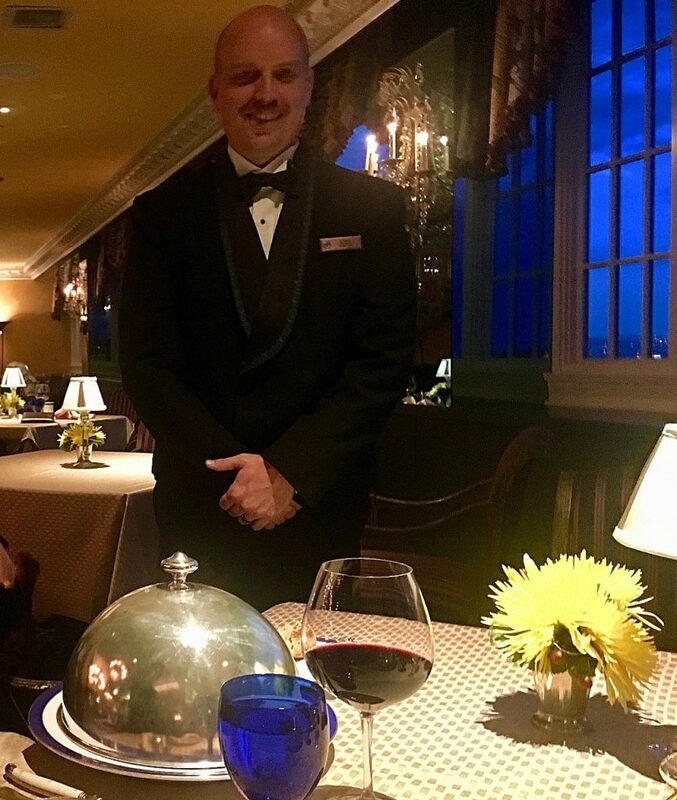 For a true formal dining experience, dancing, and some of the best views in the city, enjoy a multi-course dinner at the Penrose Room. Find out more HERE. 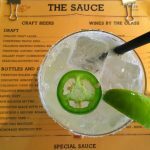 We were guests of the Penrose Room, opinions are my own. Image 1 courtesy of the Penrose Room, Image 7, 8 from Google Images.